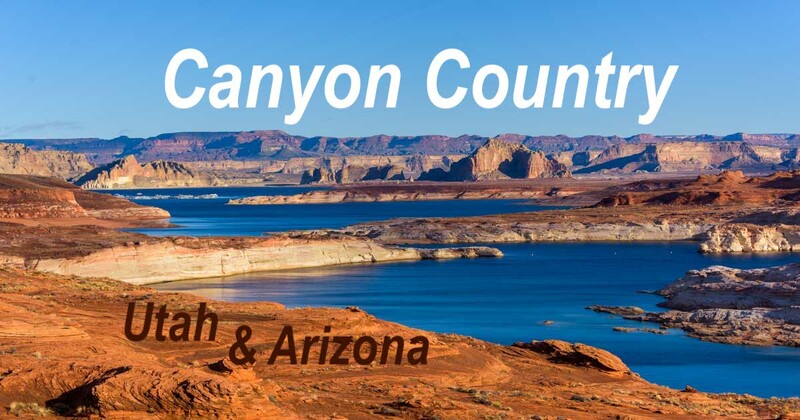 Canyon Country Highlights – Lake Powell, Horseshoe Bend & More! 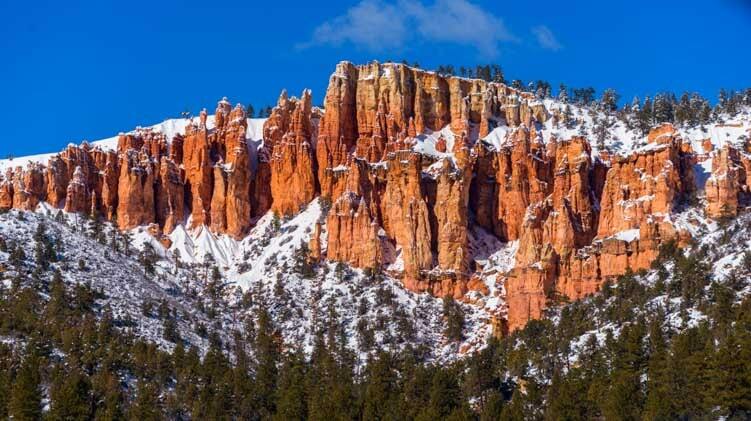 Just outside of Bryce Canyon is one of our favorite places, Red Canyon. We love the hiking trails there. What fun it was to see its two tunnels through the red rocks decorated in snow! 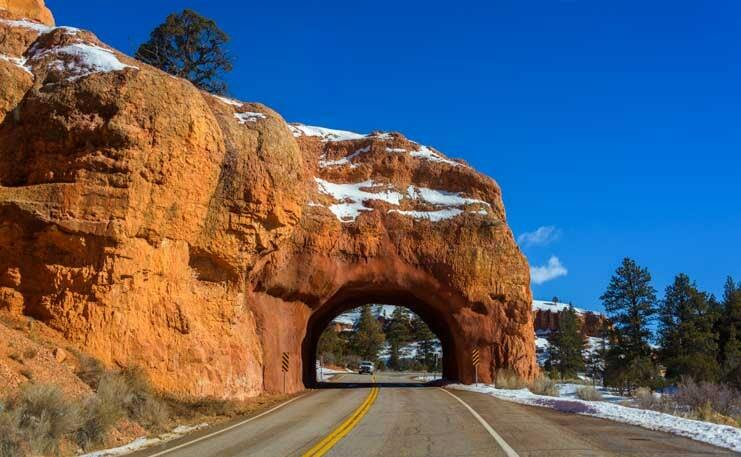 Red Canyon has two charming tunnels in the red rocks – and in winter they have snow! 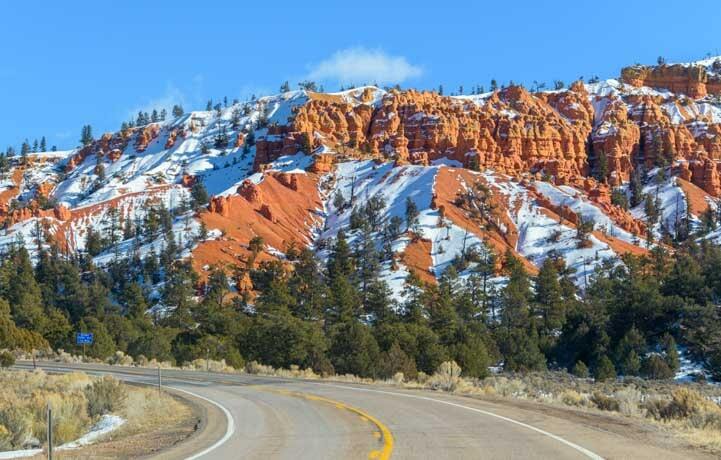 The area around Bryce Canyon was beautiful in its winter finery, and we got a huge kick out of driving the scenic roads and seeing familiar red rock formations peeking out from beneath a layer of snow. A glimpse of the edge of Red Canyon across a wintry landscape. Bryce-like rock formations peered out from the mountains a few miles from the actual Canyon. 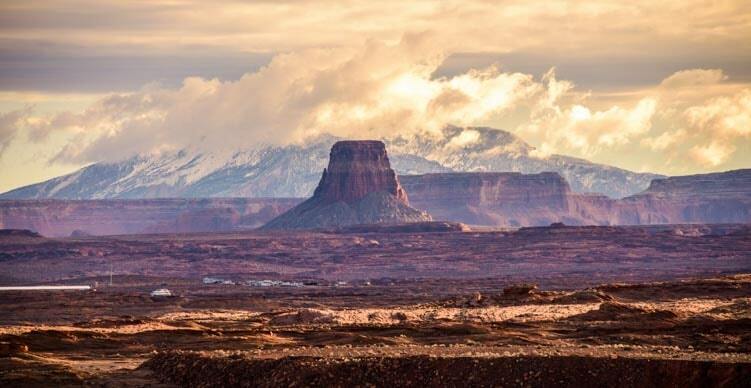 Red rock country makes for wonderful scenic drive in summer, but how beautiful to see it with snow! 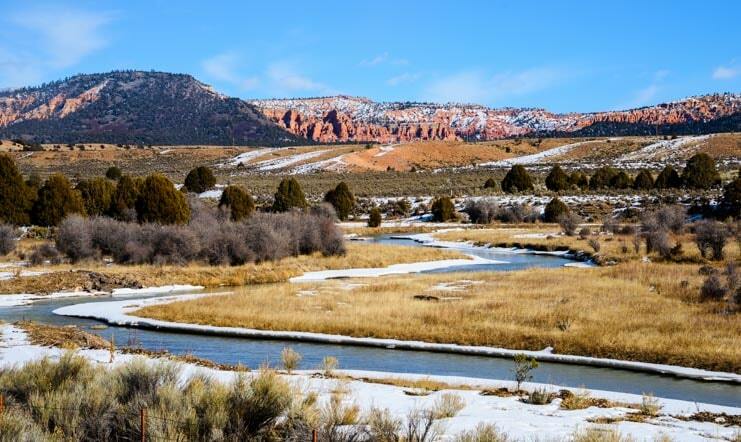 The valleys near Bryce Canyon stood silent in their winter slumber save for a few homesteads here and there. As we descended out of the high 8,000′ plateau where Bryce Canyon is situated, we said goodbye to the snow one last time. Buddy loved the snow, but it was time to leave it behind. The wonderfully scenic US-89 passes through spectacular red rock landscapes as it approaches and then leaves Kanab, Utah, and we reminisced as we passed the turn-off for the incomparable Wire Pass Slot Canyon hike and the charming Toadstools Hike, both barely noted with small brown signs on the highway. 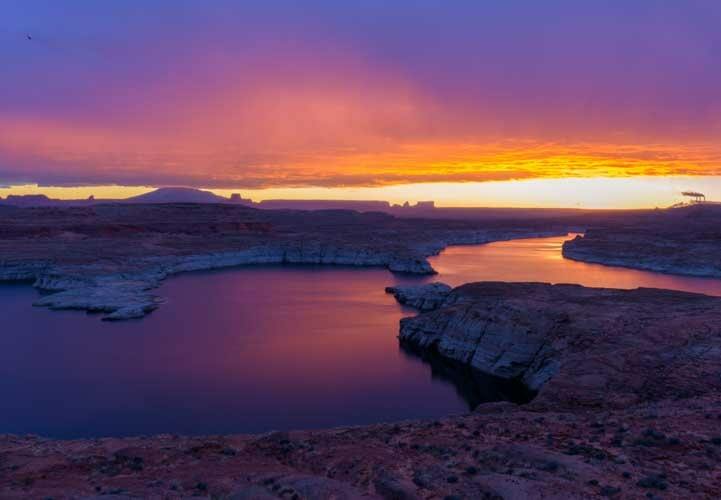 And then we were suddenly immersed in the beauty of Glen Canyon. 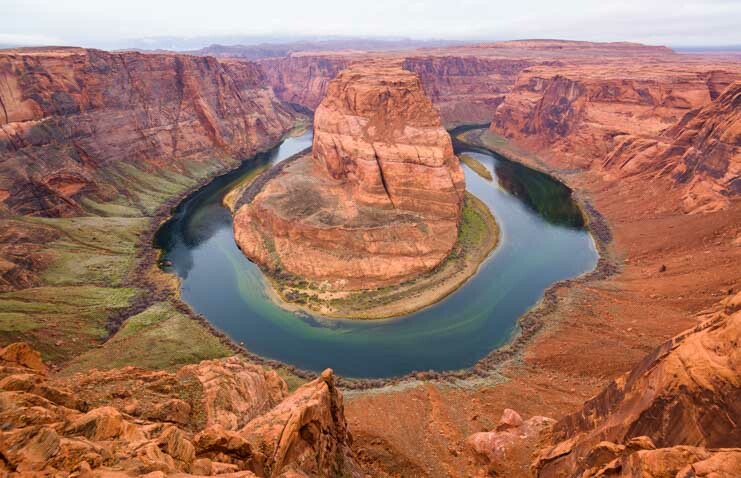 This exquisite canyon was carved by the relentless flow of the Colorado River which has sculpted the surrounding colorful sandstone into a myriad of shapes. 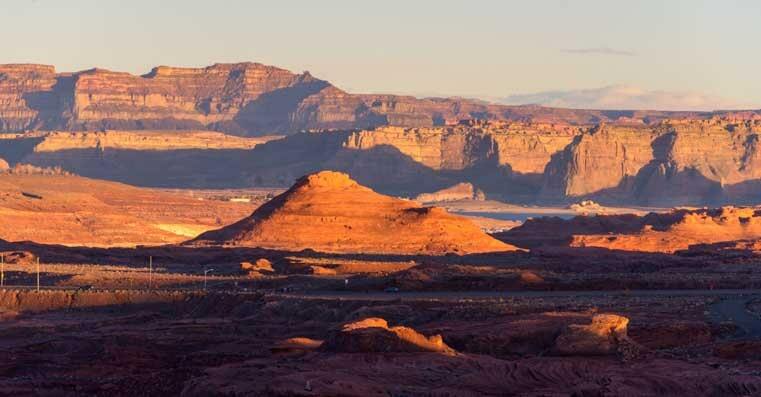 Late afternoon at Glen Canyon. 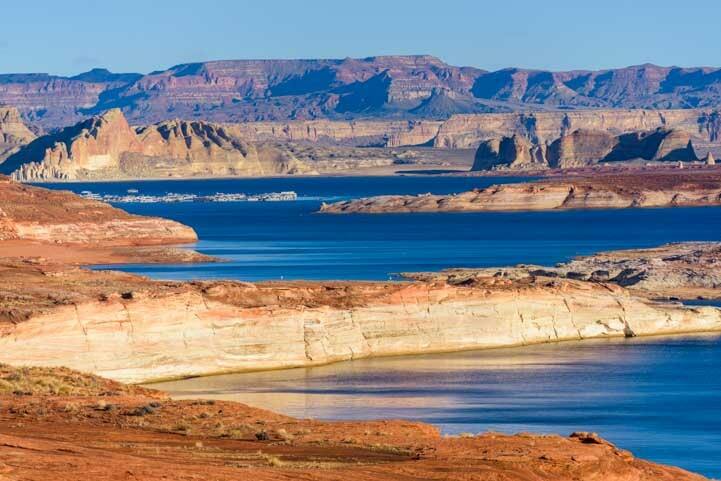 The Colorado River was dammed here to form Lake Powell, and the vivid blue of the lake set against the towering stone cliffs was jaw-dropping in the morning sun. 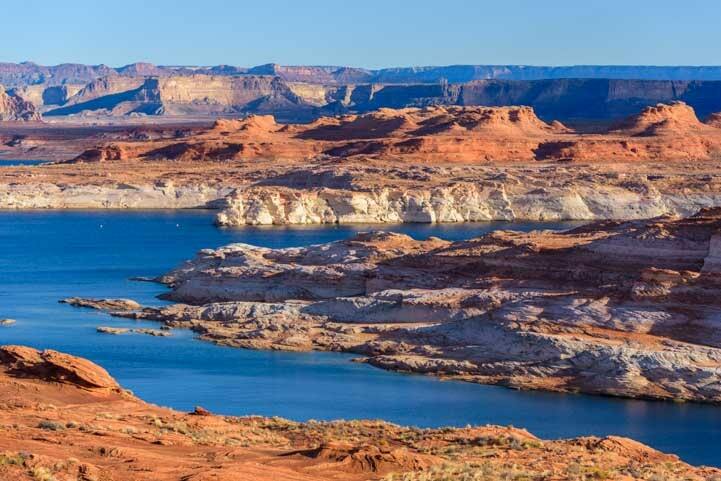 Lake Powell is the centerpiece of Glen Canyon National Recreation Area. 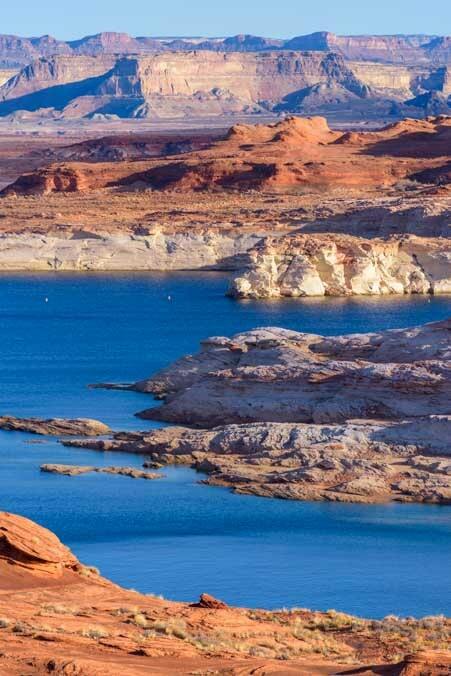 We had seen brochure pictures of Lake Powell like this, but to see it in person was a feast for the eyes. What a fantastic contrast — or complement — to the snow at Bryce Canyon and the mysterious light show at Grand Canyon that we had just witnessed days earlier. We drove down to the beach to get a little closer to the water. The stone monoliths towered on the other side of the small cove. What an exotic landscape! This is a fabulous spot for photography! 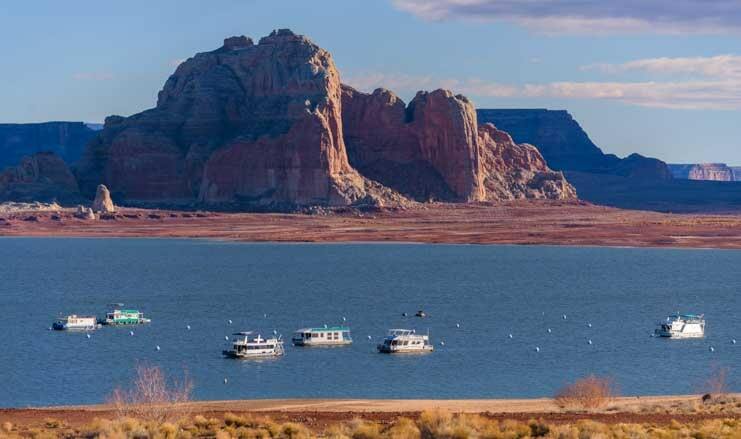 There is a marina, hotel and restaurant complex on the shore at Lake Powell, and we could see the marina docks in the distance. The air became a little hazy as the day wore on, but the deep crimson red rocks were just stunning! The distant red rocks were a deep crimson! A group of houseboats anchored in the bay looked very inviting. We told each other we’ll have to do an overnight in one someday. A concessionaire for the National Park Service rents them out!! Houseboats anchored in the bay. What a fun excursion that would be! This guy loved the beach! 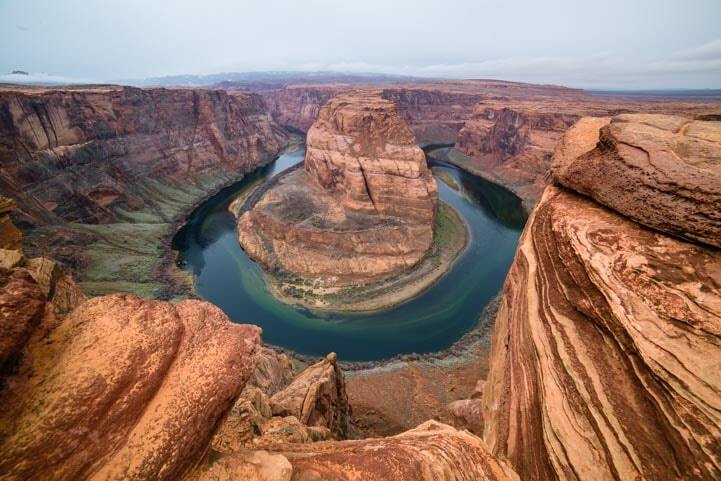 The eye-popping Horseshoe Bend Overlook is a little bit south of Lake Powell, and although we’ve visited before (blog post here), we couldn’t drive through the area without stopping in to take another look. We were shocked when we arrived to see that massive construction is underway in the parking lot and on the hill between the parking lot and the overlook to make it easier to support the enormous crowds of tourists that flock here every hour of every day. What used to be a small parking lot will soon be at least four times bigger. A slew of vault toilets have been installed, and it looks like a road is going in to take tourists right to the rim. Right now visitors still walk straight up over the berm on a dirt path to the overlook. The new road will go around the berm on the south side. It’s not clear whether walkers or motorized vehicles or both will use the road, perhaps only tour buses. We were also quite astonished to see a railing protecting part of the rim now as well. Now, anyone who is unnerved by standing on the edge of a several thousand foot drop can stand by the railing with confidence. The rocks near the edge of the overlook have fantastic markings. Most of the rim is still wide open and easily explored, however, and plenty of crazy people were doing their selfie stunts just inches from a lethal fall (a girl fell off and died over Christmas this year). But it was the beautiful lines and patterns in the rocks at our feet that really caught our attention. This is a special little gem of a spot. A fish-eye view catches the wake of a boat cruising by on the river below! 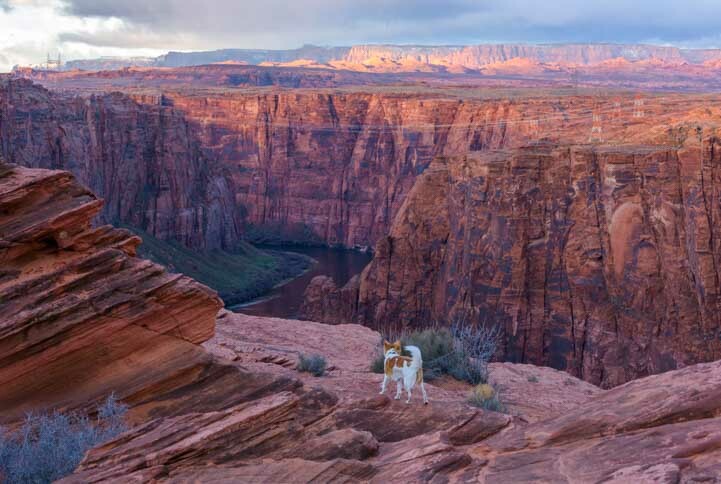 Whereas Horseshoe Bend is busy busy busy and a true jaw-dropper to boot, a nearby scenic overlook at Glen Canyon Dam is fully developed for people to explore but had no visitors but us when we stopped by one morning. 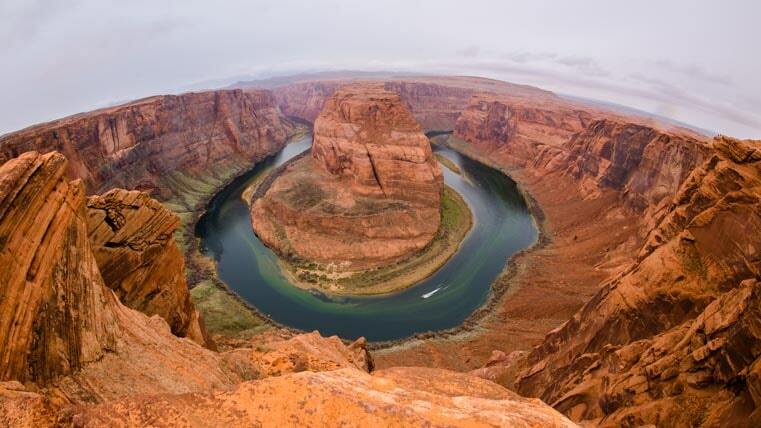 The Colorado River is visible four thousand feet below — just as it is at Horseshoe Bend a few miles away — and the rust colored canyon walls are incredibly sheer. 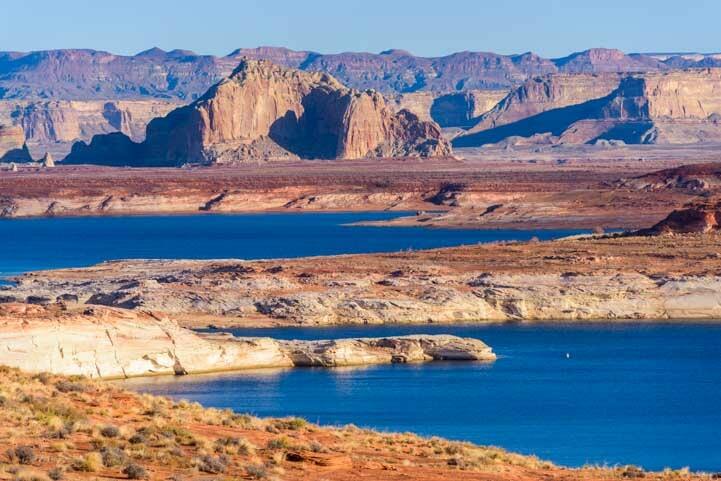 The Glen Canyon Dam Scenic Overlook was beautiful and dramatic — and we were the only ones there! We just loved the lines in the rocks and the infinite variety of patterns they create. 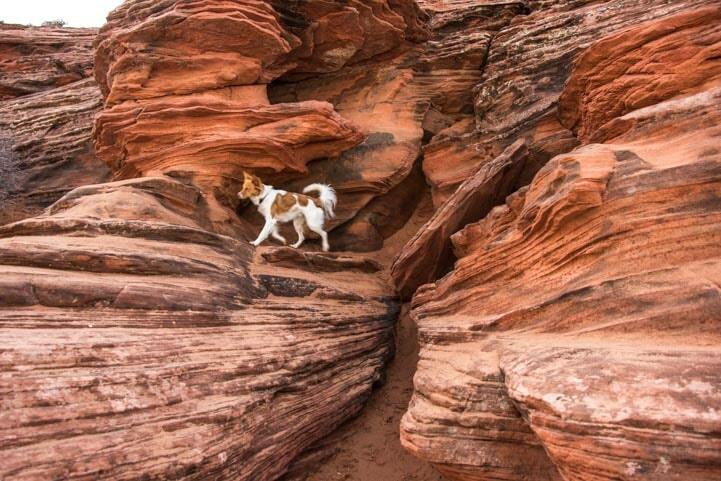 Such wonderful lines in the rocks! It is a kid’s paradise for running around on the rocks. These rocks are very cool to climb on. 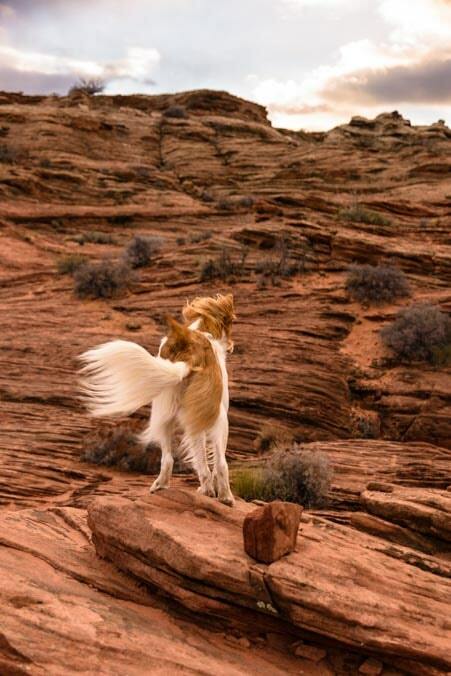 Mark won a photo contest with this unique photo of a strong gust of wind blowing on Buddy! 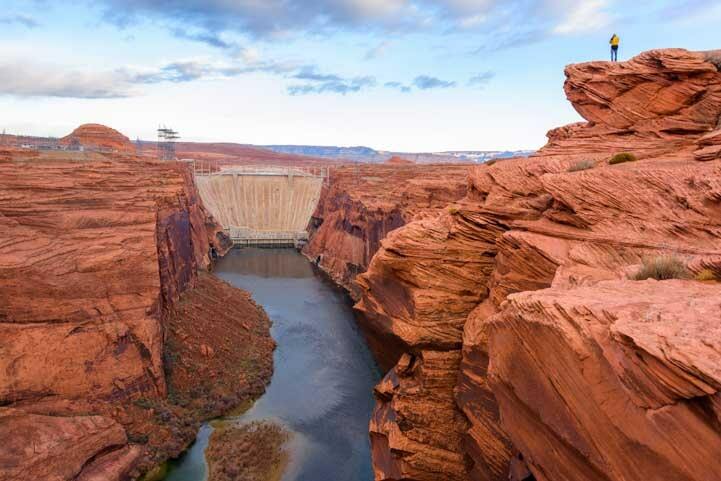 Glen Canyon Dam is a short distance away tucked between massive cliffs! To get a sense of scale, notice Mark in the upper right corner taking a photo of the dam! Meanwhile, storms brewed above the mesas and mountains on the horizon. This whole part of Canyon Country between Bryce Canyon, Utah, and Page, Arizona, is exquisite, and is truly a delight for photography. 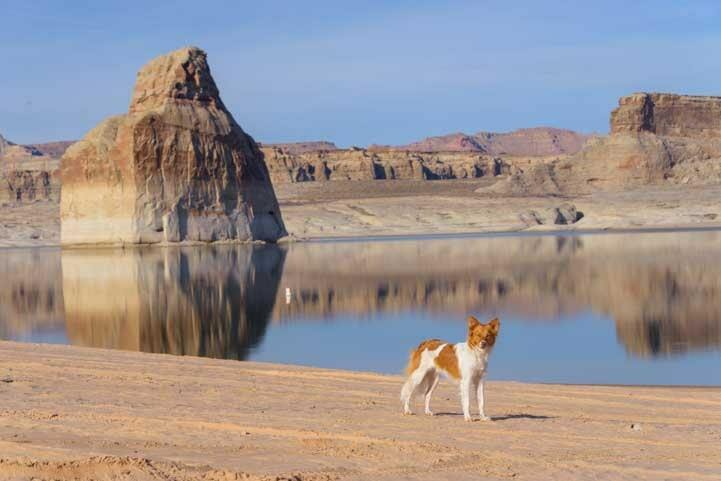 We were up with the chickens one morning to see if we could capture something special down at Lake Powell. And sure enough, the sun gave us a show to remember! When we first arrived at the shore at dawn, the sky and water took on shades of purple and magenta. The sunrise was brilliant, but even as the sun made its appearance on one horizon, storm clouds were forming on the other. We loved the contrast of light and dark. 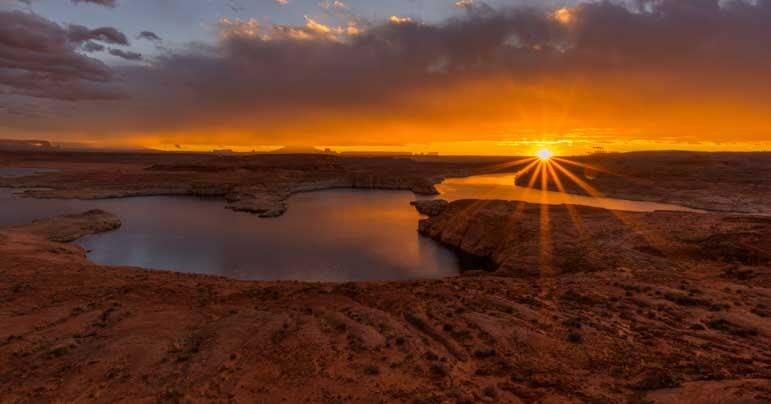 As the sun cast its last glow across the land before giving in to the coming storm, it lit the horizon’s classic southwestern horizon of mesas and rock pinnacles. While the sun rose on one side the storm clouds grew darker on the other. What a beautiful way to end our quick trip through Canyon Country to see the Best of the West under snow! 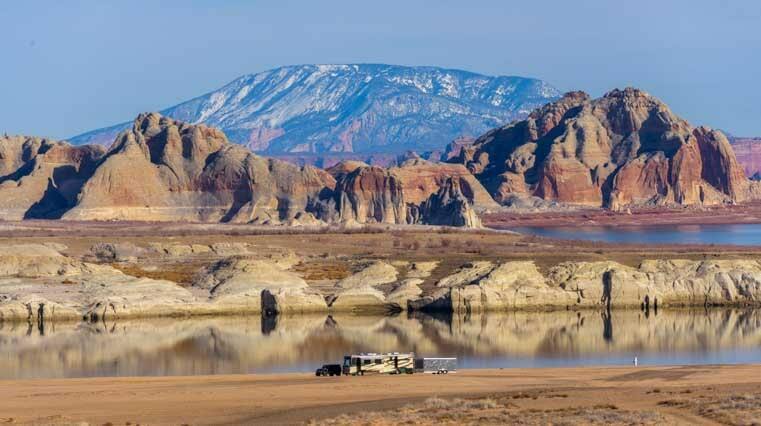 Before long we were back in our trailer in Phoenix getting ready to head out with our new RZR and try our new triple-towing adventures. 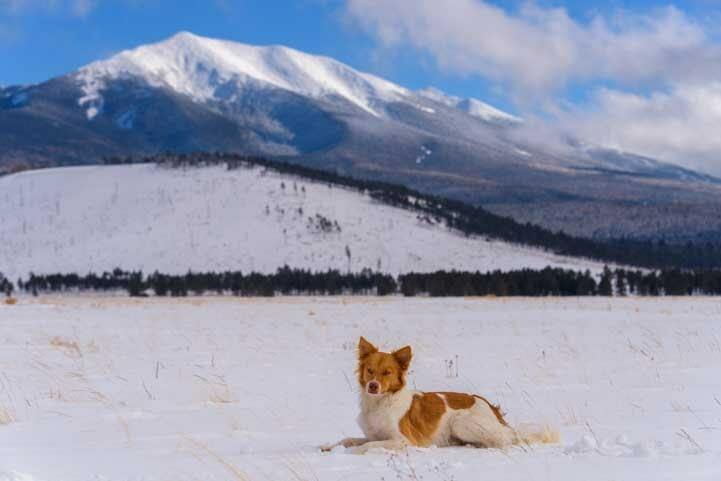 But this week-long interlude at some of America’s most beautiful places in mid-winter is a trip we will remember forever. 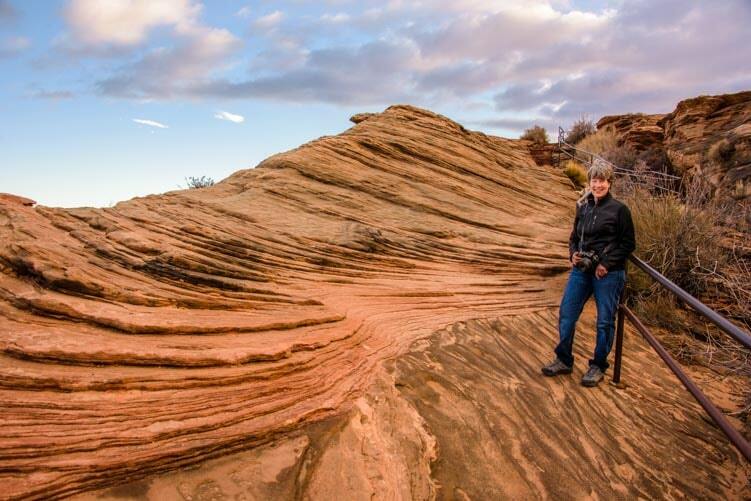 This entry was posted in Arizona and tagged Arizona, Arizona Northeast, New, Travel, USA, Utah, Utah Southeast, WP Travel by Roads Less Traveled. Bookmark the permalink. Nobody better’n ya’ll to remind me of where i’ve been……and where i’m going. They’re beautiful places, aren’t they, Scott?! Enjoy!! Thanks for this post! We have enjoyed this area so much since we started going around 1980. 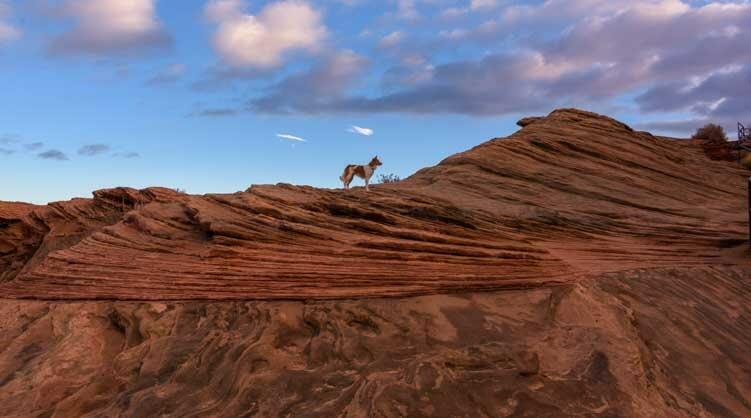 Beautiful pictures, love the ones with Buddy enjoying the area. 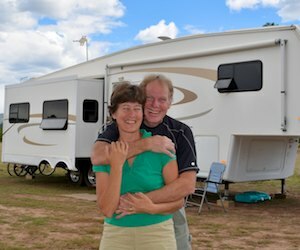 We also love Red Canyon campground. We met up with you there when we were camped there with our Egg campers. I am going to share this with Ginny and Wally. 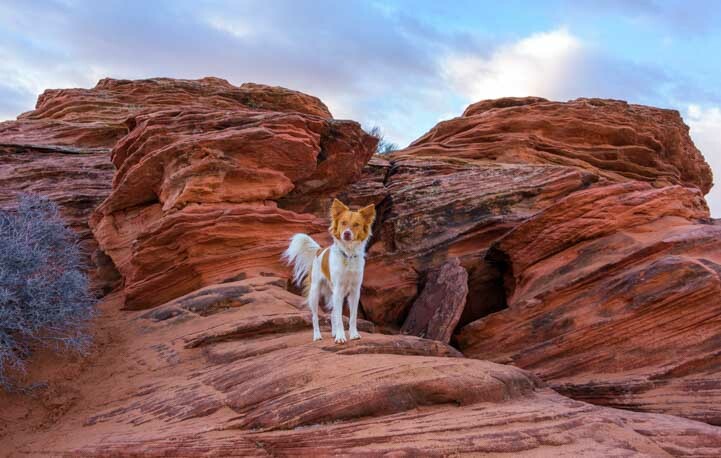 We remember seeing you at Red Canyon, Liz! We were so fascinated by your Egg Camper — such a cute rig! That campground is very special to us because it’s where we decided to upgrade from a tent to a popup tent trailer way back when. A rainy cold front came through, and everyone in an RV was having a grand old time with the heat going and the lights on and the Monopoly game on the table. Meanwhile, we ran around from coffee bistro to lunch restaurant trying to stay warm and dry. Within a week we owned a brand new popup and the rest is history! What an exciting time this is for you, Peter & Therese. You are going to have a blast with your travels, and your eyes will be opened in new and special ways you never imagined before. Have fun at Escapade in Tucson. Thanks for reading our blog. We’ll look for you down the road! He’s such a fun little exploring partner. It seems his favorite days are the ones where we are out in nature in new places prowling around. So he’s an integral part of the scenery we see and deserves a special spot in our pics! Thank you, Deborah. The light was changing so fast that morning. We just loved watching the storm coming in while the sun was still spreading its morning rays across the lake. Thank you for joining us on the roads less traveled. Buddy loves the attention too!! Nature’s beauty in snow and sun….and such a spectacular sunburst sunrise ! And now “off-road” adventures – HAPPY TRAILS in the new RZR. Thank you! The RZR is proving to be lots of fun and is getting us deep into the back country where we’re finding all kinds of interesting things! !